TORONTO, Oct. 4, 2018 /CNW/ - First Cobalt Corp. (TSX-V: FCC; ASX: FCC; OTCQX: FTSSF) (the "Company") is pleased to announce drill results from its Iron Creek Cobalt Project in Idaho, USA. Results reported today highlight a high grade zone at the western extent of the current Inferred Resource, which remains open along strike and at depth. 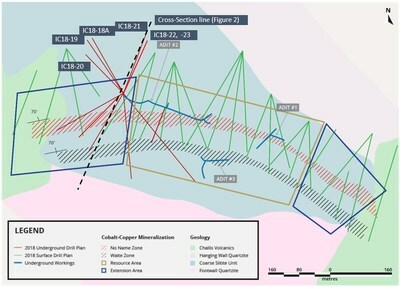 "High grade cobalt and copper zones within wider mineralized zones, such as those reported here, expand our options for development as we look to the future of this project. As work advances, I am repeatedly impressed by the increasing potential of this resource and look forward to updating our mineral resource estimate in early 2019 with results from the ongoing program." 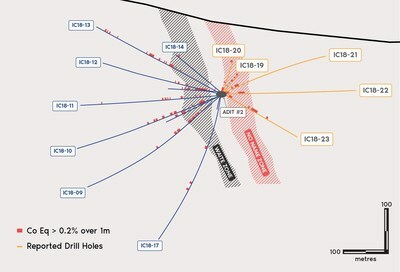 Results reported above, other than drill holes IC18-21 and -22, were included in the Inferred Resource estimate reported September 26, 2018. Cobalt equivalent is calculated as %CoEq = %Co + (%Cu/10) based on US$30/lb Co and US$3/lb Cu. No metallurgical recoveries were applied to either metal as it is expected that the metallurgical recoveries will be similar for both metals. Flotation tests support the Company's opinion that both cobalt and copper are of sufficient grade to be recovered. 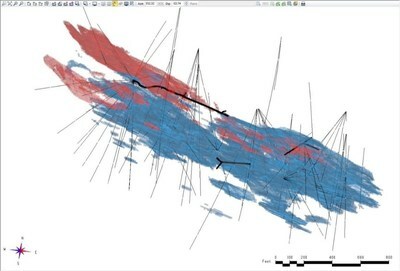 True thickness estimated from 3D geological model also considering drill holes on strike. Preliminary floatation tests have indicated a separate copper concentrate could potentially be produced so copper-rich mineralization could be processed separately to ensure high quality source feed. Today's results show a sizeable strike extent of higher-grade copper that warrants specific attention for future mine development planning.